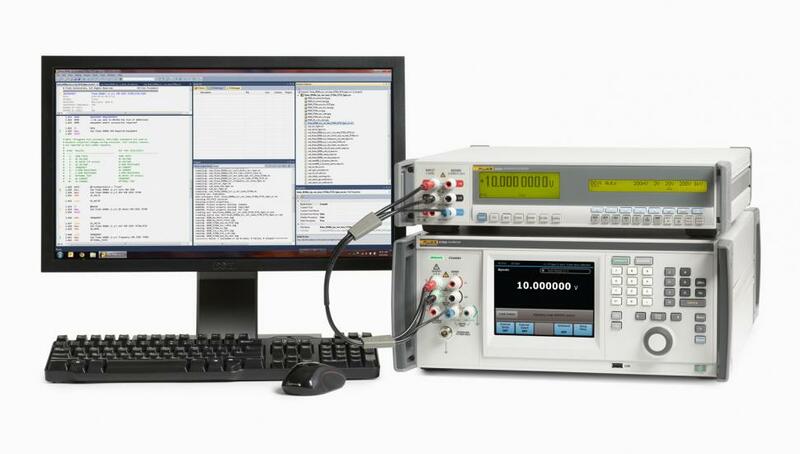 The Fluke Calibration 5730A High Performance Multifunction Calibrator is the culmination of years of engineering development, customer research and industrial design, to bring to market the new “gold standard” in electrical multifunction calibration. 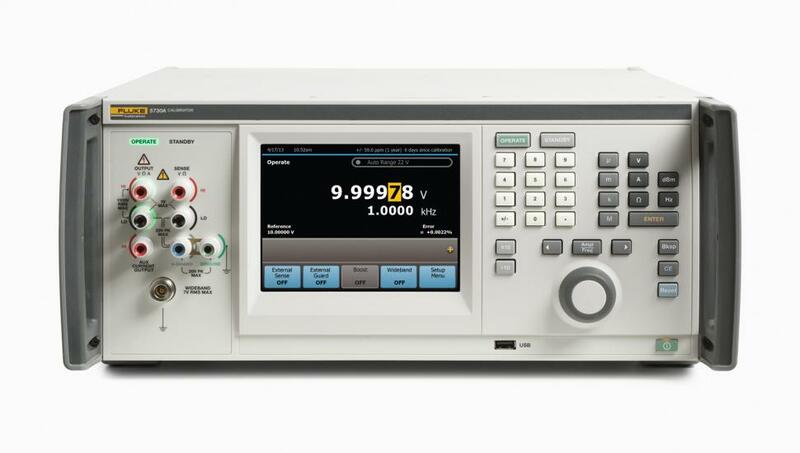 Like its predecessors, the 5730A calibrates a wide range of digital multimeters, up to long-scale 8.5 digit DMMs, as well as RF voltmeters when equipped with the wideband option. But this new model features improved specifications that will help you increase test uncertainty ratios (TURs) and increase test confidence. What’s more, the improved specifications will reduce your need to guardband, giving you confidence and peace of mind in your calibrations. 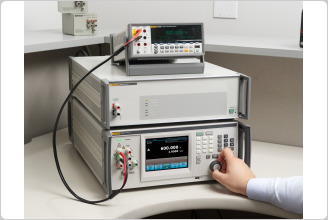 The 5730A is designed for calibration professionals who require the most accurate dc/lf signals available in a multifunction calibrator, as well as those who simply want the best calibrator available. 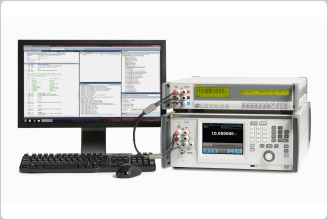 Metrologists in national laboratories, the military, third party calibration laboratories, and corporate users with high-end workload will value the performance and reliability of the 5730A. All 5730A calibrators are traceable to international standards and are produced in the factory with ISO/IEC 17025 accredited calibrations. Specifications are stated to the standard Fluke Calibration 99 % confidence level (as well as 95 % confidence level) to support easy measurement comparisons according to international quality standards. Specifications are absolute and include the uncertainty of the calibration standards used. No additional analysis is required. The 5730A calibrator incorporates the latest technology and usability features. 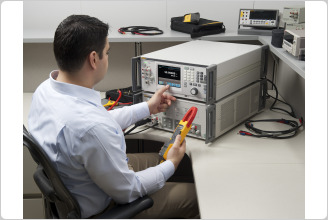 Surface mount technology and modern digital components have enabled Fluke Calibration to advance the proven design of the 5700A/5720A and create the next generation of high performance multifunction calibrators. The 5730A keeps many of the front-panel details that characterize its predecessors, while adding a new full color touch screen display to enhance usability and help you calibrate more efficiently. Users enter values via a familiar, calculator-style keyboard, working naturally from left to right. A new graphical user interface features easy-to-read, easy-to-use menus, as well as access to common functions with just the touch of a finger. Status indicators for OPERATE, STANDBY, and HAZARDOUS VOLTAGE appear on the screen in bright letters or icons that you can easily recognize from across the calibration lab. The touch screen messages are available in your choice of nine languages, including English, French, German, Spanish, Japanese, Chinese, Portuguese, Russian, and Korean. The redesigned front panel features many new improvements. For example, Visual Connection Management™ output terminals light up to show you which terminals are active, guiding the user to make the correct connections. The handles and knob are overmolded for comfort and feel. USB ports are placed both on the front and rear of the unit. Use the port at the front to download internal calibration constants; use the rear port for remote communication with a PC—or choose the LAN, IEEE or serial interfaces. The 5730A calibrator features Artifact Calibration. 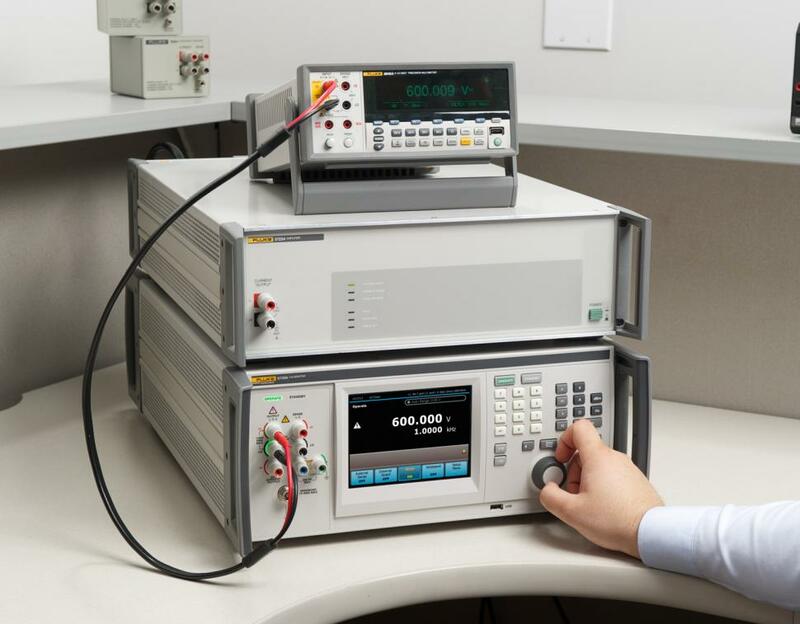 Only three artifact standards—a 10 V dc reference and 1 Ohm and 10 k Ohm resistance references—are required to calibrate all ranges and functions to full specifications. Front panel GUI instructions prompt the operator to make connections and inputs each step of the way. The calibrator controls the process, which takes only about an hour, compared to several hours using traditional calibration methods. In addition to saving time and equipment costs, Artifact Calibration can extend time between calibrations of the 5730A to two years before a full verification check by a Fluke Service Center is required. And, because the 5730A can tolerate operating temperatures between 15 °C and 35 °C, it can be calibrated where it’s used, rather than having to be shipped to a standards laboratory for calibration. When Artifact Calibration was first introduced in the Fluke 5700A, customers asked many questions about traceability because they were surprised that you could calibrate so many ranges and functions with only three external standards. However, thanks in part to considerable testing and evaluation by three national laboratories in Europe, Artifact Calibration is fully validated by the metrology community. Today many metrologists rely on Artifact Calibration to maintain their Fluke calibrators at 90-day specifications for up to two years. Significant savings can be realized in calibration costs by only paying for a full verification and shipping to a certified Fluke Service Center every two years. The time savings are also significant, as Artifact Calibration allows the 5730A to remain in service and conducting calibrations when it would otherwise be unavailable due to shipping and service time. Speak to a Fluke Calibration representative today to learn how to embrace this tried and true method of maintaining the traceability of your 5730A. For extra confidence that the 5730A calibrator stays within its specifications between calibrations, the built-in automated Cal Check function checks every range and function against a set of dedicated internal standards to monitor the drift of each. These Cal Check results can be downloaded to a computer via the USB port conveniently placed on the front of the unit to develop control charts predicting the calibrator’s long-term performance. It may surprise many to learn that the internal standards built into every 5730A are the functional and design equivalents of a Fluke 732B 10 V reference plus two fully characterized metrology-grade resistance standards. These standards—totally separated from the output circuitry—are not used in normal operation and are provided solely to provide a check. It has been become increasingly difficult to meet the industry-recognized test uncertainty ratio (TUR) of 4:1. To minimize the chance of approving an out-of-tolerance (OOT) condition during calibration, the practice of guardbanding is employed. As all measurements are subject to error, most measurements assume a normal distribution commonly referred to as a “bell curve.” When the TUR is less than 4:1, the error band of the unit under test (UUT) is small enough that the calibrator cannot guarantee that the measurement is within specification. To protect the metrologist, guardbanding moves the specification limit closer to the nominal value in order to “guard” against the possibility of approving an OOT condition. The measured value must now fall within a smaller offset from the nominal value, providing confidence that the actual value is within the new specified band. This gives the metrologist the confidence that the measurement is accurate. 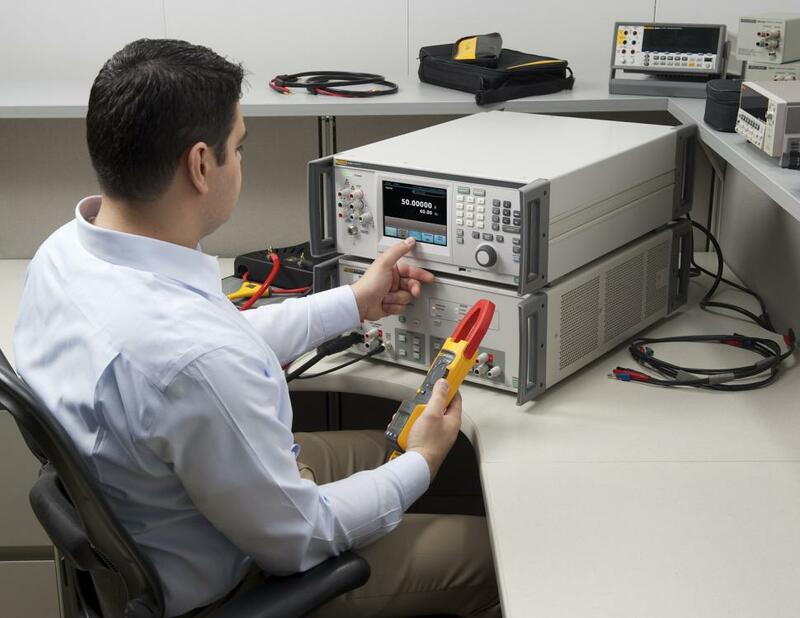 The new 5730A calibrator is the most accurate dc/lf calibrator on the market, but it still requires the use of guardbanding for the most demanding long-scale multimeters. 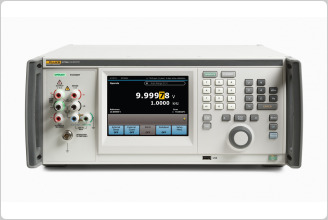 Paired with a Fluke Calibration 52120A Transconductance Amplifier, the 5730A can output up to 120 A and display the output on the 5730A touch screen display. Operating in closed-loop mode with the 52120A, the 5730A maintains the best current accuracy over the widest range of calibration workload.